I am interested in cardiovascular health - in particular why people are suffering heart attacks at such a young age. The second part of my research is the regeneration of heart muscle following heart attacks and heart failure. We are looking at stem cell therapy to replace damaged tissue in the heart with viable, functional muscle. It's in the clinic that research questions pop into my mind, which then drives the experimental research in the laboratory. We are also conducting clinical trials on drug treatments and surgical interventions for cardiac patients. My passion for research was ignited when I saw too many young people in the clinic struck down by heart attacks, with those who survive often suffering with heart failure or weakness of the heart muscle. Heart attacks are so wasteful and so tragic for the patients’ families, and as a clinician I was drawn to both that acute side of cardiovascular research and also the chronic medical aspects surrounding the long-term weakness of the heart muscle after such an attack. My vision for my research is better cardiac health in the Hunter region and reversing the damage caused by prior heart attacks to promote long and healthy lives for patients. Professor Andrew Boyle is a clinically trained cardiologist and respected leader in cardiovascular research. He has a keen interest in the reparative processes in the heart after damage and how to reverse scaring and tissue damage after heart attacks. After completing his PhD in cardiac regeneration at the University of Melbourne and a prestigious postdoctoral position at Johns Hopkins University in the US, he then studied the effects of ageing on the ability of the heart to pump oxygenated blood to the rest of the body (left ventricular remodeling). Professor Boyle now leads a successful research laboratory based at HMRI where he studies pre-clinical models of left ventricular remodeling, and is also an active clinician and clinical researcher at the John Hunter Hospital working to improve the outcomes of people affected by heart attacks and heart muscle damage. In the laboratory, Professor Boyle and his team study several important aspects of heart function and heart remodeling after damage. He is currently investigating the potential for stem cells to repair the human heart after events like a heart attack and believes that this avenue of research holds promising results for the future treatment of patients. He is also involved in a number of clinical trials that aim to find new drug treatments for people affected by cardiovascular disease and also to develop new heart valves for implantation in patients. 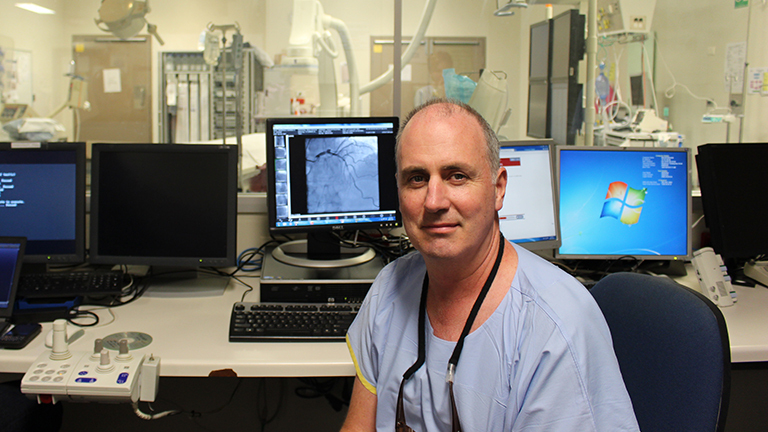 Professor Boyle is a Fellow of the Society for Cardiac Angiography and Intervention, the American Heart Association, the American College of Cardiology, a Professor and also the Head of the Cardiovascular Medicine Disciple at the University of Newcastle. He has published over 80 peer reviewed scientific articles and has presented at numerous national and international conferences around the world. Department of Cardiovascular Medicine, John Hunter Hospital. Department of Cardiology, Lake Macquarie Private Hospital.